Zoo: Hearthstone budget deck is back! It is the early days of Hearthstone’s Journey to Un’Goro expansion, and the meta is slowly being figured out. While the ladder is mostly populated by Rogues (Quest and Miracle), Warriors (Pirate and Taunt), and Hunters (Midrange), all classes are currently seeing some play. One of the things I’m happiest about with Journey to Un’Goro is that it is now possible to build a good deck on a budget again, even on your first day of playing Hearthstone! The deck I have in mind is Zoo. Zoo is a basic archetype in the game. 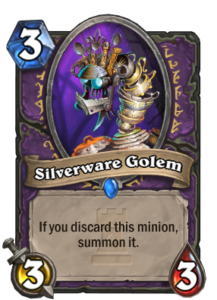 It’s a deck that focuses on playing relatively cheap minions that synergize well with each other and utilizing the Warlock Hero Power card draw engine to ensure that it does not run out of steam. It has periodically been at the top of the ladder food chain and at times almost completely disappeared. 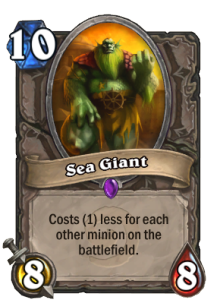 There have been slower variants that run Sea Giants to bring in some big threats, and faster variants that top out at the highly explosive, charging Doomguard. More recently, Zoo has mostly been of the discard variety: focusing on cards that have good effects, but that force you to discard random cards from your hand. 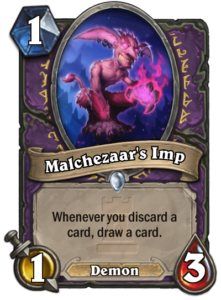 This type of Zoo deck is heavily reliant on the One Night in Karazhan adventure, because Malchezaar’s Imp and Silverware Golem are key cards in the deck that reduce the downsides of discard effects, and even turn them into benefits. 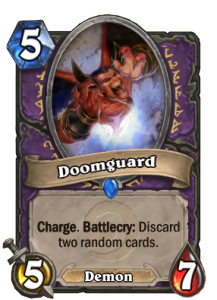 Discard Zoo is by necessity a fast deck, as you cannot afford to run expensive cards that sit in your hand for a long time in it: they will just get discarded before you have a chance to play them. It fits the current meta though, as the game is overall quite fast at the moment. However, if you want to build Zoo on a budget, you are forced to build the more traditional variant with less discard effects: without the cards from One Night in Karazhan, Discard Zoo is simply too punishing, you will run out of cards even with the Warlock Hero Power. Luckily, Journey to Un’Goro brings some nice power plays with which it is possible to build a viable regular Zoo deck even on your first (long) day of playing. The total cost of the deck is 1520 dust, less than a single legendary card, and that is assuming you get nothing from packs and have to craft each and every common card! I built and tested this deck on the NA server in the early days of the new expansion, rising from the bottom to rank 7 with a 69-38 (65%) record. Positioning (many minions have effects related to minions next to them, so how do I need to position my minions to benefit from the effects in the best way). These lessons are much more difficult to learn playing, say, a Pirate Warrior. At the start of the game, your goal is to get on the board and stay there. You have to find a 1-cost minion to open the game with, and often you want to use the coin to play two 1-cost minions on your first turn, unless you also have a powerful 3-cost minion, such as the Darkshire Councilman that you can play on turn two. If you plan to go for a 3-cost minion on turn two, you need to play a minion that can challenge the opponent’s board enough on turn one. 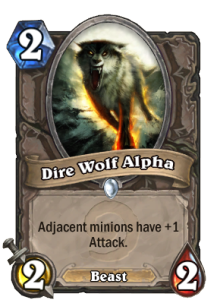 If you find an Abusive Sergeant or Dire Wolf Alpha in your opening hand, you can often use them on turn two to get better trades with the minion or minions you play on one. 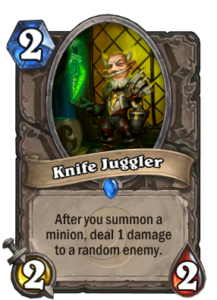 Knife Juggler, on the other hand, is at its best when you can play it together with multiple minions or behind a taunt to help it survive until future turns. 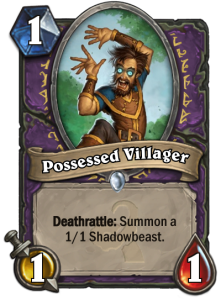 Deathrattles and tokens (Possessed Villager, Fire Fly, Eggnapper, Devilsaur Egg) synergize with Knife Juggler (more knives), Dire Wolf Alpha (position the weaker non-deathrattle minions next to each other to use the buff on them one at a time), Darkshire Councilman (grows), and Ravenous Pterrordax (food). 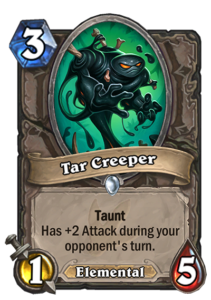 Tar Creeper offers your weaker minions protection and can help you pick the trades you want. In an aggressive meta, it also helps to protect your life total. 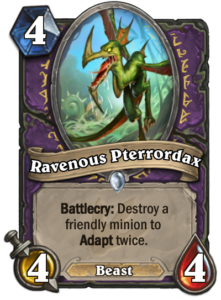 The dream combo is a turn 3 Devilsaur Egg into a turn 4 Ravenous Pterrordax for two powerful minions on the board on turn 4. 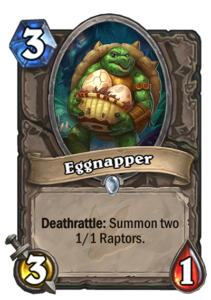 However, any of your tokens can serve as food, there is no reason to wait for the Egg to show up. 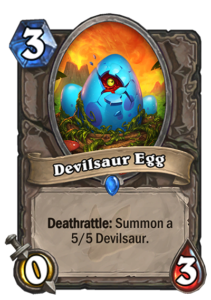 Devilsaur Egg can be activated either by feeding it to the Ravenous Pterrordax or by attacking it into something with Dire Wolf Alpha, Abusive Sergeant, or Defender of Argus. Doomguard tops out the curve and offers its usual power and durability. Often you will have to discard something in order to get the Doomguard into play, but that just happens, price needs to be paid without worrying too much. The flex slots in the list are the Acidic Swamp Oozes at 2 mana and the Tar Creepers at 3 mana. I expect the meta to stay very aggressive, so Tar Creeper seems to be there to stay. 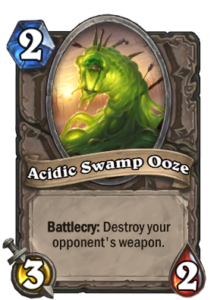 Whether to use the Acidic Swamp Ooze or not depends on the number of weapon-users in the meta: right now there are plenty of Warriors and Hunters, so the Ooze is pretty good. 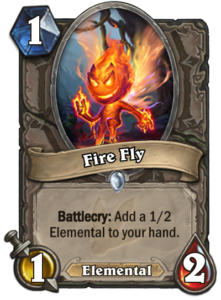 I have also played a lot with Faerie Dragon in that slot, because it is better against Rogue, who usually wants to remove minions with spells, and Faerie Dragon cannot be targeted. Another option for the slot could be Golakka Crawler, a crab that eats pirates, but that is a rare card so it pushes up the cost of the deck a little. Acidic Swamp Ooze has the cost advantage over all other options: as a basic card, it is part of every player’s collection. 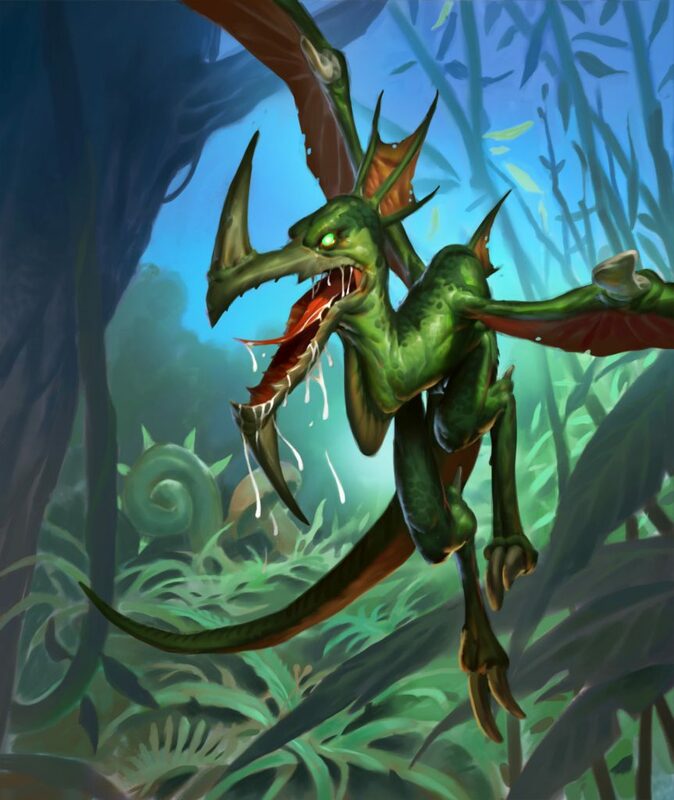 While certain legendaries and decks built around them have become more and more dominant in Hearthstone, it is good to see that Journey to Un’Goro also offers the means to build a competitive deck at a low cost. I discussed this possibility in my pre-release reviews, and now with the cards out and playtesting done, I’m happy to confirm that the deck works. Of course, it has underwent slight revisions when actual playtesting has been possible, but the core of the deck remains as anticipated after card reveals. This deck seems very strong. Surprisingly I haven’t faced it on the ladder yet, any particular reasons for that? currently in rank 13. There are a couple of reasons why Zoo has become weaker over the past week: Taunt Warrior, Freeze Mage, and Miracle Rogue. 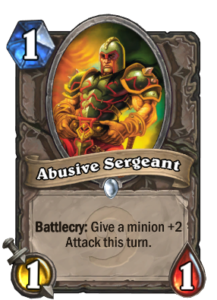 While Zoo demolishes Quest Rogue and is able to play an even game against Pirate Warrior and Hunter, it is rather miserable against Taunt Warrior and Freeze Mage, both of which have seen a lot of play as of late. Furthermore, many Rogue players have switched over to Miracle Rogue, and while Zoo can take on Miracle Rogue, it is a lot closer matchup than Quest Rogue. I’ll try to find time to tweak a budget Midrange Hunter list, that should fit the current meta a little better. Aggro Druid is the third viable budget option.